Where does plastic collect in the ocean? Further information on this topic can also be found at our FAQs on Plastics. A slide-deck summary of global plastics is available here. Below is a short overview of what we cover in this entry. We have also produced an FAQs on Plastics page which attempts to answer additional common questions on the topic. Plastic pollution is having a negative impact on our oceans and wildlife health. There have been many instances of marine impacts [jump to section]. High-income countries tend to generate more plastic waste per person [jump to section]. However, how plastic waste is managed determines its risk of entering the ocean. High-income countries have very effect waste management systems; mismanaged waste (and ocean inputs) are therefore low. Poor waste management across many middle- and low-income countries means they dominate the sources of global ocean plastic pollution [jump to section]. This makes the improvement of waste management systems across the world critical to addressing plastic pollution. Overall, approximately 80 percent of ocean plastics come from land-based sources, and 20 percent from marine. But, in particular regions, marine sources can dominate. More than half of plastics in the Great Pacific Garbage Patch (GPGP) come from fishing nets, ropes and lines [jump to section]. It&apos;s also important to note that plastic is a unique material with many benefits: it&apos;s cheap, versatile, lightweight, and resistant. This makes it a valuable material for many functions. It can also provide environmental benefits through certain supply chains: it plays a critical role in maintaining food quality, safety and preventing waste. The trade-offs between plastics and substitutes (or complete bans) are therefore complex and could create negative knock-on environmental impacts [discussed in our FAQs on Plastics here]. To understand the magnitude of input of plastics to the natural environment and world&apos;s oceans, we must understand various elements of the plastic production, distribution and waste management chain. This is crucial, not only in understanding the scale of the problem but in implementing the most effective interventions for reduction. The data and visualizations which follow in this entry are developed to provide this overview step-by-step. This is summarised in the figure below2. an estimated 10,000s to 100,000s tonnes of plastics are in the ocean surface waters (several orders of magnitude lower than ocean plastic inputs). This discrepancy is known as the &apos;missing plastic problem&apos; and is discussed here. How much plastic does the world produce? In the chart below we see the evolution of annual global plastic production, measured in tonnes per year. This is shown from 1950 through to 2015. The short downturn in annual production in 2009 and 2010 was predominantly the result of the 2008 global financial crisis — this dent is seen across several metrics of resource production/consumption, including energy. 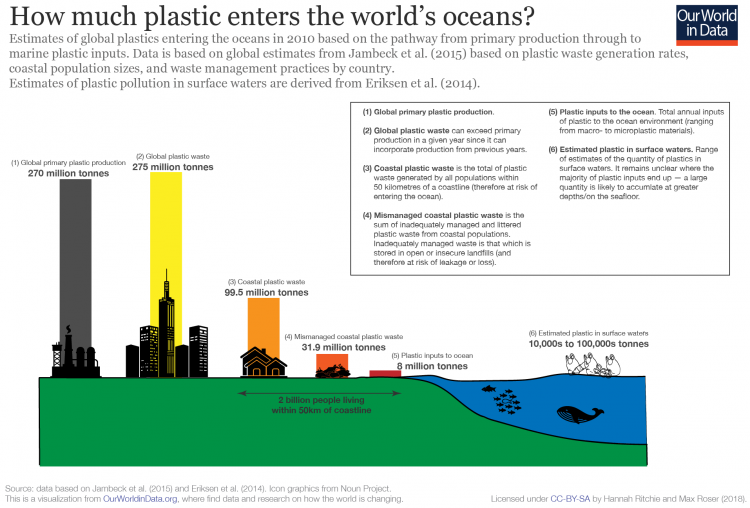 How much plastic has the world produced cumulatively? This trend over the period from 1950 to 2015 is shown in the chart below. By 2015, the world had produced 7.8 billion tonnes of plastic — more than one tonne of plastic for every person alive today. How has global plastic waste disposal method changed over time? In the chart below we see the share of global plastic waste that is discarded, recycled or incinerated from 1980 through to 2015. Prior to 1980, recycling and incineration of plastic was negligible; 100 percent was therefore discarded. From 1980 for incineration, and 1990 for recycling, rates increased on average by about 0.7 percent per year.4 In 2015, an estimated 55 percent of global plastic waste was discarded, 25 percent was incinerated, and 20 percent recycled. If we extrapolate historical trends through to 2050 — as can be seen in the chart here — by 2050, incineration rates would increase to 50 percent; recycling to 44 percent; and discarded waste would fall to 6 percent. However, note that this is based on the simplistic extrapolation of historic trends and does not represent concrete projections. In the figure below we summarise global plastic production to final fate over the period 1950 to 2015.5 This is given in cumulative million tonnes. 500 million tonnes (6 percent) was recycled (100 million tonnes of recycled plastic was still in use; 100 million tonnes was later incinerated; and 300 million tonnes was later discarded or sent to landfill). Of the 5800 million tonnes of primary plastic no longer in use, only 9 percent has been recycled since 1950. To which industries and product uses is primary plastic production allocated? In the chart below we see plastic production allocation by sector for 2015. Packaging was the dominant use of primary plastics, with 42 percent of plastics entering the use phase.6 Building and construction was the second largest sector utilizing 19 percent of the total. Primary plastic production does not directly reflect plastic waste generation (as shown in the next section), since this is also influenced by the polymer type and lifetime of the end product. Primary plastic production by polymer type can be found here. The chart above shows the use of primary plastics by sector; in the chart below we show these same sectors in terms of plastic waste generation. Plastic waste generation is strongly influenced by primary plastic use, but also the product lifetime. Packaging, for example, has a very short &apos;in-use&apos; lifetime (typically around 6 months or less). This is in contrast to building and construction, where plastic use has a mean lifetime of 35 years.7 Packaging is therefore the dominant generator of plastic waste, responsible for almost half of the global total. In 2015, primary plastics production was 407 million tonnes; around three-quarters (302 million tonnes) ended up as waste. Plastic waste breakdown by polymer type can be found here. In the chart below we see the per capita rate of plastic waste generation, measured in kilograms per person per day. Here we see differences of around an order of magnitude: daily per capita plastic waste across the highest countries – Kuwait, Guyana, Germany, Netherlands, Ireland, the United States – is more than ten times higher than across many countries such as India, Tanzania, Mozambique and Bangladesh. Note that these figures represent total plastic waste generation and do not account for differences in waste management, recycling or incineration. They therefore do not represent quantities of plastic at risk of loss to the ocean or other waterways. In the chart below we see the total plastic waste generation by country, measured in tonnes per year. This therefore takes account of per capita waste generation and population size. This estimate is available only for the year 2010, but as we see later in this entry, the relative global picture is similar in projections to 2025. With the largest population, China produced the largest quantity of plastic, at nearly 60 million tonnes. This was followed by the United States at 38 million, Germany at 14.5 million and Brazil at 12 million tonnes. Like the per capita figures above, note that these figures represent total plastic waste generation and do not account for differences in waste management, recycling or incineration. They therefore do not represent quantities of plastic at risk of loss to the ocean or other waterways. Beyond domestic plastic waste generation, there is also a large global commodity market for recycled plastic waste. Global trade of plastic is discussed later in this entry. Mismanaged waste is material which is at high risk of entering the ocean via wind or tidal transport, or carried to coastlines from inland waterways. Mismanaged waste is the sum of material which is either littered or inadequately disposed. Inadequately disposed and littered waste are different, and are defined in the sections below. Inadequately disposed waste is that which has the intention of being managed through waste collection or storage sites, but is ultimately not formally or sufficiently managed. This includes disposal in dumps or open, uncontrolled landfills; this means the material is not fully contained and can be lost to the surrounding environment. This makes it at risk of leakage and transport to the natural environment and oceans via waterways, winds and tides. High-income countries, including most of Europe, North America, Australia, New Zealand, Japan and South Korea have very effective waste management infrastructure and systems; this means discarded plastic waste (even that which is not recycled or incinerated) is stored in secure, closed landfills. Across such countries almost no plastic waste is considered inadequately managed. Note this does not mean there is no plastic at risk of entering the natural environment — see the section on littering below. Across many low-to-middle-income income countries, inadequately disposed waste can be high; across many countries in South Asia and Sub-Saharan Africa, between 80-90 percent of plastic waste is inadequately disposed of, and therefore at risk of polluting rivers and oceans. This is strongly reflected in the global distribution of mismanaged waste and inputs from river systems. Littered waste is distinct from &apos;inadequately disposed&apos; waste in that it represents plastics that are dumped or disposed of without consent in an inappropriate location. A global map of littered plastic from coastal populations (within 50 kilometres of a coastline) is shown here. Whilst the global picture of total plastic waste tells an important story, it does not necessarily help us to understand the ocean plastic problem. To understand the sources of ocean plastic pollution we must take into account multiple factors: proximity of given population centres to the coast, and national waste management strategies. Not all of the plastic waste we generate is at high risk of entering the oceans; in fact, for many countries the quantity which does end up as ocean pollution is very small. (1) they quantified plastic waste generated by coastal populations (those within 50 kilometres of a coastline) — this represents plastic waste with the potential to be transported to the coast. Plastic waste generated further inland is unlikely to travel this distance. (2) they corrected this figure for the quantity of plastic waste that is mismanaged. Mismanaged waste is the sum of inadequately managed waste (that which is not formally managed such as disposal in dumps or open, uncontrolled landfills which could leak to the surrounding environment) and littered waste. Mismanaged waste within coastal populations has strong potential to eventually enter the ocean either through transport by wind or tides, or through waterways such as rivers or wastewater. After correcting for these factors, the share of global mismanaged plastic waste by country is shown in the chart below. This data is available to explore on a per capita basis and on an absolute basis (in tonnes per country). Note that whilst this data is available only for the year 2010, projections of global trends for the year 2025 (discussed in the section below) show a very similar distribution. Here we see a very strong geographical clustering of mismanaged plastic waste, a high share of the world&apos;s ocean plastics pollution has its origin in Asia. China contributes the highest share of mismanaged plastic waste with around 28 percent of the global total, followed by 10 percent in Indonesia, 6 percent for both the Philippines and Vietnam. Other leading countries include Thailand (3.2 percent); Egypt (3 percent); Nigeria (2.7 percent) and South Africa (2 percent). We discuss why such countries have high mismanaged plastic waste rates later in this entry. Whilst many countries across Europe and North America had high rates of per capita plastic generation, once corrected for waste management, their contribution to mismanaged waste at risk of ocean pollution is significantly lower. In the chart below we see the global distribution of mismanaged plastic waste aggregated by world region. The East Asia and Pacific region dominates global mismanaged plastic waste, accounting for 60 percent of the world total. There is a wide gap between East Asia and the other regions — South Asia ranks second but contributes around 5 times less with 11 percent of the total. This is followed by Sub-Saharan Africa (9 percent); Middle East & North Africa (8.3 percent); Latin America (7.2 percent); Europe and Central Asia (3.6 percent) and North America (1 percent). These results are presented in the map below as the share of global mismanaged waste by country, and aggregated by region. Absolute figures (in tonnes per year) by country is available to explore here. Plastic in our oceans can arise from both land-based or marine sources. Plastics pollution from marine sources refers to the pollution caused by fishing fleets that leave behind fishing nets, lines, ropes, and sometimes abandoned vessels. There is often intense debate about the relative importance of marine and land sources for ocean pollution. What is the relative contribution of each? Although uncertain, it&apos;s likely that marine sources contribute between 20-30 percent of ocean plastics, but the dominant source remains land-based input at 70-80 percent. Whilst this is the relative contribution as an aggregate of global ocean plastics, the relative contribution of different sources will vary depending on geographical location and context. For example, its estimated that plastic lines, ropes and fishing nets comprise 52 percent of the plastic mass in the &apos;Great Pacific Garbage Patch&apos; (GPGP) (and comprises 46 percent of the megaplastics component of the GPGP).16 The relative contribution of marine sources here is likely to be the result of intensified fishing activity in the Pacific Ocean. There are multiple routes by which plastic can enter the ocean environment. One key input is through river systems. This can transport plastic waste from further inland to coastal areas where it can enter the ocean. As we see in the following charts, there is high concentration of plastic within river systems geographically. In the chart below we list the estimated input of plastic to the oceans from the top 20 polluting rivers across the world. This was estimated by Lebreton et al. (2017) for the year 2015.17 Below they are listed in order with the name of the river, and the countries through which it passes. The top 20 polluting rivers accounted for more than two-thirds (67 percent) of the global annual river input. Geographically we see that the majority of the top 20 rivers are located in Asia. River Yangtze, the top polluting river, had an input of approximately 333,000 tonnes in 2015 —just over 4 percent of annual ocean plastic pollution. In the chart below we see river plastic inputs to the ocean aggregated by region — this is given as a share of the global total. Here we see a clear dominance of river plastic inputs from Asia, which represents 86 percent of the global total. This is followed by Africa at 7.8 percent, and South America at 4.8 percent. Collectively, Central & North America, Europe and the Australia-Pacific region account for just over one percent of the world total. Plastic enters the oceans from coastlines, rivers, tides, and marine sources. But once it is there, where does it go? The distribution and accumulation of ocean plastics is strongly influenced by oceanic surface currents and wind patterns. Plastics are typically buoyant – meaning they float on the ocean surface –, allowing them to be transported by the prevalent wind and surface current routes. As a result, plastics tend to accumulate in oceanic gyres, with high concentrations of plastics at the centre of ocean basins, and much less around the perimeters. After entry to oceans from coastal regions, plastics tend to migrate towards the centre of ocean basins. In the chart below we see estimates of the mass of plastics in surface ocean waters by ocean basin. Eriksen et al. (2014) estimated that there was approximately 269,000 tonnes of plastic in surface waters across the world.18 Note that this at least an order of magnitude lower than estimated inputs of plastics to the ocean; the discrepancy here relates to a surprising, but long-standing question in the research literature on plastics: "where is the missing plastic going?". As we see, basins in the Northern Hemisphere had the highest quantity of plastics. This would be expected since the majority of the world&apos;s population – and in particular, coastal populations – live within the Northern Hemisphere. However, authors were still surprised by the quantity of plastic accumulation in Southern oceans — while it was lower than in the Northern Hemisphere, it was still of the same order of magnitude. Considering the lack of coastal populations and plastic inputs in the Southern Hemisphere, this was an unexpected result. The authors suggest this means plastic pollution can be moved between oceanic gyres and basins much more readily than previously assumed. It&apos;s estimated that there are more than 5 trillion plastic particles in the world&apos;s surface waters.19 We can see this breakdown of plastic particles by ocean basin here. The accumulation of a large number of particles tends to result from the breakdown of larger plastics — this results in an accumulation of plastic particles for a given mass. The figure below summarises plastics in the ocean surface waters by basin. This is shown by particle size in terms of mass (left) and particle count (right). As shown, the majority of plastics by mass are large particles (macroplastics), whereas the majority in terms of particle count are microplastics (small particles). The most well-known example of large plastic accumulations in surface waters is the so-called &apos;Great Pacific Garbage Patch&apos; (GPGP). As shown in the chart above, the largest accumulation of plastics within ocean basins is the North Pacific. This results from the combined impact of large coastal plastic inputs in the region, alongside intensive fishing activity in the Pacific ocean. In a Nature study, Lebreton et al. (2018) attempted to quantify the characteristics of the GPGP.20 The vast majority of GPGP material is plastics — trawling samples indicate an estimated 99.9 percent of all floating debris. The authors estimate the GPGP spanned 1.6 million km2. This is just over three times the area of Spain, and slightly larger in area to Alaska (the USA&apos;s largest state).21 The GPGP comprised 1.8 trillion pieces of plastic, with a mass of 79,000 tonnes (approximately 29 percent of the 269,000 tonnes in the world&apos;s surface oceans). Over recent decades, the authors report there has been an exponential increase in concentration of surface plastics in the GPGP. 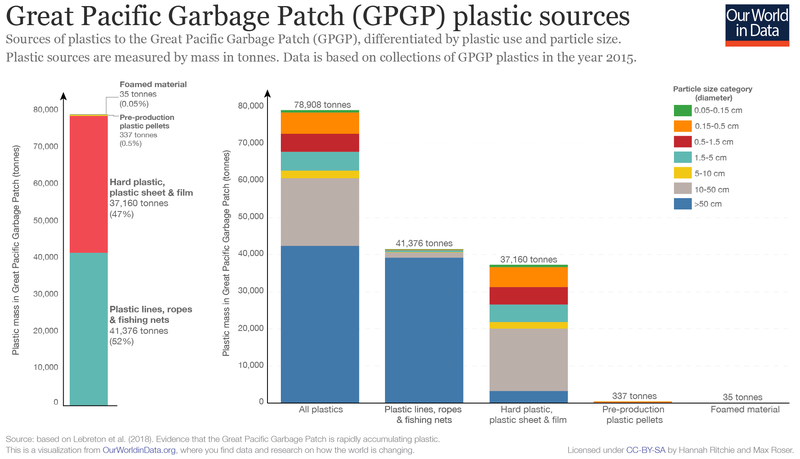 In the chart below we see the estimated composition of the GPGP plastic. Around 52 percent of plastics originated from fishing activity and included fishing lines, nets and ropes; a further 47 percent was sourced from hard plastics, sheets and films; and the remaining components were small in comparison (just under one percent). The dominance of fishing lines, nets, hard plastics and films means that most of the mass in the GPGP had a large particle size (meso- and macroplastics). Tracking ocean plastic inputs and distribution in the ocean is notoriously difficult.22 As we have seen throughout this entry, there is a large discrepancy between the annual inputs of plastics to the ocean, and estimates of surface plastic accumulation. Annual estimates of ocean plastic input is in the order of up to 10 millions tonnes; meanwhile total surface plastic accumulations are in the order of 10s to 100s of thousand tonnes (one or multiple orders of magnitude lower).23,24,25,26. This discrepancy is known as the &apos;missing plastic&apos; problem. It&apos;s unknown where the majority of ocean plastics end up. There are multiple hypotheses as to where missing plastic accumulates. It&apos;s important to note that within the marine environment, plastics can more readily break down into smaller particles: exposure to ultraviolet (UV) radiation, and consistent mechanical abrasion from wave action can cause larger particles to break down. This allows for easier incorporation into sediments and ingestion by organisms. A likely &apos;sink&apos; for ocean plastics are deep-sea sediments; a study which sampled deep-sea sediments across several basins found that microplastics, in the form of fibres, was up to four orders of magnitude more abundant (per unit volume) in deep-sea sediments from the Atlantic Ocean, Mediterranean Sea and Indian Ocean than in plastic-polluted surface waters.27 The other possible sinks of missing plastics are shallow-sea sediments, in addition to potential ingestion by organisms. The quantification of these aspects are as yet unknown. There have been many documented incidences of the impact of plastic on ecosystems and wildlife. Peer-reviewed publications of plastic impacts date back to the 1980s. An analysis by Rochman et al. (2016)28 reviews the findings of peer-reviewed documentation of the impacts of marine plastic debris on animal life; the results of this study are presented in this table.29 Nonetheless, despite many documented cases, it&apos;s widely acknowledged that the full extent of impacts on ecosystems is not yet known. Entanglement: The entrapping, encircling or constricting of marine animals by plastic debris. Entanglement cases have been reported for at least 344 species to date, including all marine turtle species, more than two-thirds of seal species, one-third of whale species, and one-quarter of seabirds.31 Entanglement by 89 species of fish and 92 species of invertebrates has also been recorded. Entanglements most commonly involve plastic rope and netting32 and abandoned fishing gear.33. However, entanglement by other plastics such as packaging have also been recorded. Ingestion: Ingestion of plastic can occur unintentionally, intentionally, or indirectly through the ingestion of prey species containing plastic and it has now been documented for at least 233 marine species, including all marine turtle species, more than one-third of seal species, 59% of whale species, and 59% of seabirds.34 Ingestion by 92 species of fish and 6 species of invertebrates has also been recorded. Ingestion of plastics can have multiple impacts on organism health. Large volumes of plastic can greatly reduced stomach capacity, leading to poor appetite and false sense of satiation.36 Plastic can also obstruct or perforate the gut, cause ulcerative lesions, or gastric rupture. This can ultimately lead to death. Interaction: interaction includes contact with plastic debris (with exception of entanglement) including collisions, obstructions, abrasions or use as substrate. There are multiple scenarios where this can have an impact on organisms. Fishing gear, for example, has been shown to cause abrasion and damage to coral reef ecosystems upon collision. Ecosystem structures can also be impacted by plastics following interference of substrate with plastics (impacting on light penetration, organic matter availability and oxygen exchange). As discussed in the section on &apos;Impacts on Wildlife&apos; above, there are several ways in which plastics can interact or influence wildlife. In the case of microplastics (particles smaller than 4.75 millimeter in diameter), the key concern is ingestion. There a number of potential effects of microplastics at different biological levels, which range from sub-cellular to ecosystems, but most research has focused on impacts in individual adult organisms. Microplastic ingestion rarely causes mortality in any organisms. As such, &apos;lethal concentration&apos; (LC) values which are often measured and reported for contaminants do not exist. There are a few exceptions: common goby exposure to polyethylene and pyrene; Asian green mussels exposed to polyvinylchloride (PVC); and Daphnia magna neonates exposed to polyethylene42,43,44 In such studies, however, concentrations and exposure to microplastics far exceeded levels which would be encountered in the natural environment (even a highly contaminated one). Many organisms do not exhibit changes in feeding after microplastic ingestion. A number of organisms, including suspension-feeders (for example, oyster larvae, urchin larvae, European flat oysters, Pacific oysters) and detritivorous (for example, isopods, amphipods) invertebrates show no impact of microplastics.51 Overall, however, it&apos;s likely that for some organisms, the presence of microplastic particles in the gut (where food should be) can have negative biological impacts. There is, currently, very little evidence of the impact of microplastics in humans. Despite having no clear evidence of health impacts, research on potential exposure is ongoing. Plastic fibres have also been detected in other food items; for example, honey, beer and table salt.59,60,61 However, the authors suggested negligible health risks as a result of this exposure. Levels of microplastic ingestion are currently unknown. Even less is known about how such particles interact in the body. It may be the case that microplastics simply pass straight through the gastrointestinal tract without impact or interaction.62 A study of North Sea fish, for example, revealed that 80 percent of fish with detected microplastics contained only one particle — this suggests that following ingestion, plastic does not persist for long periods of time.63 Concentrations in mussels, in contrast, can be significantly higher. To date, there has been no clear evidence of the accumulation of persistent organic pollutants or leached plastic additives in humans. Continued research in this area, however, is important to better understand the role of plastic within broader ecosystems and risk to human health. Whilst we looked previously in this entry at the plastic waste generation rates by country across the world, it&apos;s also important to understand how plastic waste is traded across the world. Recycled plastic waste is now a product within the global commodity market — it is sold and traded across the world. This has important implications for managing global plastic waste: if countries with effective waste management systems – predominantly high-income countries – export plastic waste to middle to low-income countries with poorer management systems, they could be adding to the ocean plastic problem. Plastics can be challenging to recycle, particularly if they contain additives and a range of different plastic blends. The implications of this complexity are two-fold: in many cases it is convenient for countries to export their recycled plastic waste (meaning they don&apos;t have to handle it domestically); and for importing countries, this plastic is often discarded if it doesn&apos;t meet the sufficient requirements for recycled or is contaminated by non-recyclable plastic. As such, traded plastic waste could eventually enter the ocean through poor waste management systems. How much plastic waste does China import? In the chart below we see the quantity of plastic waste China had to manage over the period from 2010 to 2016. This is differentiated by domestic plastic waste generation, shown in grey, and imported plastic waste shown in red. The total plastic waste to manage is equal to the sum of domestic and imported plastic waste. Over this period, China imported between 7 and 9 million tonnes of plastic waste per year. In 2016, this figure was 7.35 million tonnes. To put this in context, China&apos;s domestic plastic waste generation was around 61 million tonnes. Therefore, 10-11 percent of China&apos;s total plastic waste was imported from around the world. Who are the main plastic exporters to China? Which countries export the most plastic waste to China? In the chart below we see the quantity of plastic exported to China from the top 10 exporting countries. Collectively, these countries are responsible for around 76 percent of its imports. As we see, Hong Kong typically acts as an entry point for Chinese imports; it is therefore the largest &apos;exporting&apos; country to China. Many high-income countries are included in this top 10: Japan, USA, Germany, Belgium, Australia and Canada are all major plastic exporters. How much plastic will be displaced from the Chinese import ban? China has been increasing restrictions on its plastic waste imports since 2007. In 2010, it implemented its "Green Fence" program which was a temporary restriction for plastic imports with significantly less contamination. In 2017 it implemented a much stricter, permanent ban on non-industrial plastic imports.70 In the chart below we see the estimated impact on the cumulative displacement of global plastic waste to 2030 as a result of the Chinese import ban.71 This is shown for three scenarios: assuming the maintained 100 percent import ban, in addition to the impact if this was reduced to 75 or 50 percent. countries considering importing significant quantities of plastic waste could consider an import tax specifically aimed at funding the development of sufficient infrastructure to handle such waste. In the chart below we show the plastic waste generate rate per person versus gross domestic product (GDP) per capita. In general — although there is significant variation across countries at all levels of development — plastic waste generation tends to increase as we get richer. Per capita plastic waste at low incomes tends to be notably smaller. Whilst per capita plastic waste generation tends to increase with income (see above), this general relationship does not hold when we consider mismanaged plastic waste. In the chart below we show the per capita mismanaged plastic waste generation rate versus gross domestic product (GDP) per capita. Here we see a general inverse-U curve. Mismanaged waste generation tends to be low at very low incomes (since per capita waste is small); it then rises towards middle incomes; and then falls again at higher incomes. Countries around the middle of the global income spectrum therefore tend to have the highest per capita mismanaged plastic rates. This has typically occurred where countries have rapidly industrialised (allowing for significant economic growth towards the middle of the income spectrum), but at a rate far exceeding progress in waste management. Waste management infrastructure has failed to keep pace with industrial and manufacturing growth, leading to higher rates of mismanaged waste. The development of effective waste management infrastructure, particularly in middle-income (and growing lower-income) countries will therefore be crucial to tackling the issue of plastic pollution. It is also the case that countries with high levels of mismanaged waste also have large coastal populations (as shown in the second chart below). This exacerbates the challenge of ocean plastic pollution because poorly-managed waste is at high risk of entering the ocean. In addition to this main data entry we have collated some of the most common questions on plastics on our FAQ on Plastics page. You may find the answer to additional questions on this topic there. Discarded: waste that is not recycled or incinerated; this includes waste that goes to landfill (closed or open), is littered, or lost to the natural environment. Incineration: a method waste treatment which involves the burning of material at very high temperatures. In some cases, energy recovery from the incineration process is possible. The burning of plastics can release toxins to the air and surrounding environment and should therefore be carried out under controlled and regulated conditions. Jambeck et al. (2015). Plastic waste inputs from land into the ocean. Geyer, R., Jambeck, J. R., & Law, K. L. (2017). 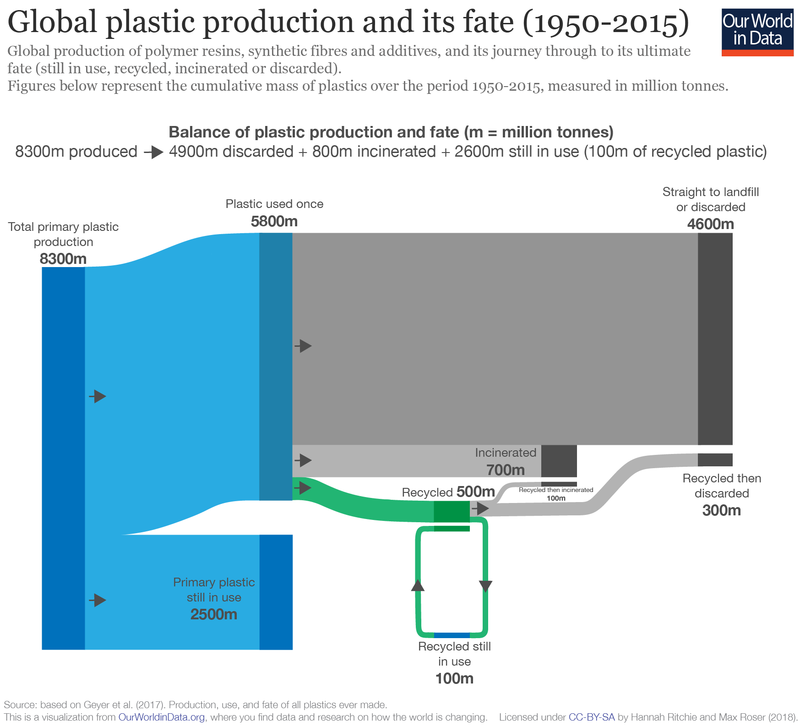 Production, use, and fate of all plastics ever made. Eriksen et al. (2014). Plastic pollution in the world&apos;s oceans: more than 5 trillion plastic pieces weighing over 250,000 tons afloat at sea. Lebreton et al. (2018). Evidence that the Great Pacific Garbage Patch is rapidly accumulating plastic. The data used in this figure is based on the Science study: Jambeck, J. R., Geyer, R., Wilcox, C., Siegler, T. R., Perryman, M., Andrady, A., ... & Law, K. L. (2015). Plastic waste inputs from land into the ocean. Science, 347(6223), 768-771. Available at: http://science.sciencemag.org/content/347/6223/768. Geyer, R., Jambeck, J. R., & Law, K. L. (2017). Production, use, and fate of all plastics ever made. Science Advances, 3(7), e1700782. Available at: http://advances.sciencemag.org/content/3/7/e1700782. Jambeck, J. R., Geyer, R., Wilcox, C., Siegler, T. R., Perryman, M., Andrady, A., ... & Law, K. L. (2015). Plastic waste inputs from land into the ocean. Science, 347(6223), 768-771. Available at: http://science.sciencemag.org/content/347/6223/768. As we see in the chart below, North America was responsible for 0.9 percent of global mismanaged plastic, and Europe & Central Asia for 3.6 percent. If plastic production (and hence potential ocean inputs) from these regions were eliminated, global mismanaged plastic would decline by only 4.5 percent. These projections assume growth in plastic generation rates and population, but that the proportion of plastic waste generation which is adequately managed remains constant. In the period from 2010 to 2025, it's therefore expected that there will be a slight shift in relative contribution from the Americas, Europe and North Africa towards Sub-Saharan Africa and South Asia. East Asia, in relative terms, will remain approximately constant. Li, W. C., Tse, H. F., & Fok, L. (2016). Plastic waste in the marine environment: A review of sources, occurrence and effects. Science of the Total Environment, 566, 333-349. Available at: https://www.sciencedirect.com/science/article/pii/S0048969716310154. UNEP & FAO (2009). Abandoned, lost or otherwise discarded fishing gear. FAO Fisheries and Aquaculture Technical Paper No. 523; UNEP Regional Seas Reports and Studies No. 185. Available at: http://www.fao.org/docrep/011/i0620e/i0620e00.htm. Lebreton, L., Slat, B., Ferrari, F., Sainte-Rose, B., Aitken, J., Marthouse, R., ... & Noble, K. (2018). Evidence that the Great Pacific Garbage Patch is rapidly accumulating plastic. Scientific Reports, 8(1), 4666. Available at: https://www.nature.com/articles/s41598-018-22939-w.
Lebreton, L. C., Van der Zwet, J., Damsteeg, J. W., Slat, B., Andrady, A., & Reisser, J. (2017). River plastic emissions to the world’s oceans. Nature Communications, 8, 15611. Available at: https://www.nature.com/articles/ncomms15611. Eriksen, M., Lebreton, L. C., Carson, H. S., Thiel, M., Moore, C. J., Borerro, J. C., ... & Reisser, J. (2014). Plastic pollution in the world's oceans: more than 5 trillion plastic pieces weighing over 250,000 tons afloat at sea. PloS one, 9(12), e111913. Available at: http://journals.plos.org/plosone/article?id=10.1371/journal.pone.0111913. The reported land area of Spain is approximately 500,000 square kilometres, and Alaska is an estimated 1.5 million square kilometres. Cressey, D. (2016). Bottles, bags, ropes and toothbrushes: the struggle to track ocean plastics. Nature News, 536(7616), 263. Available at: https://www.nature.com/news/bottles-bags-ropes-and-toothbrushes-the-struggle-to-track-ocean-plastics-1.20432. Woodall, L. C., Sanchez-Vidal, A., Canals, M., Paterson, G. L., Coppock, R., Sleight, V., ... & Thompson, R. C. (2014). The deep sea is a major sink for microplastic debris. Royal Society Open Science, 1(4), 140317. Available at: http://rsos.royalsocietypublishing.org/content/1/4/140317. This data is also presented in the review by Law (2017): Law, K. L. (2017). Plastics in the marine environment. Annual review of marine science, 9, 205-229. Available at: https://www.annualreviews.org/doi/pdf/10.1146/annurev-marine-010816-060409. Rochman, C. M., Browne, M. A., Underwood, A. J., Van Franeker, J. A., Thompson, R. C., & Amaral‐Zettler, L. A. (2016). The ecological impacts of marine debris: unraveling the demonstrated evidence from what is perceived. Ecology, 97(2), 302-312. Available at: https://esajournals.onlinelibrary.wiley.com/doi/full/10.1890/14-2070.1. Law, K. L. (2017). Plastics in the marine environment. Annual review of marine science, 9, 205-229. Available at: https://www.annualreviews.org/doi/pdf/10.1146/annurev-marine-010816-060409. Kühn, S., Rebolledo, E. L. B., & van Franeker, J. A. (2015). Deleterious effects of litter on marine life. In Marine Anthropogenic Litter (pp. 75-116). Springer, Cham. Available at: https://link.springer.com/chapter/10.1007/978-3-319-16510-3_4. Gall, S. C., & Thompson, R. C. (2015). The impact of debris on marine life. Marine pollution bulletin, 92(1-2), 170-179. Available at: https://www.sciencedirect.com/science/article/pii/S0025326X14008571. de Stephanis R, Gimenez J, Carpinelli E, Gutierrez-Exposito C, Canadas A. 2013. As main meal for sperm whales: plastics debris. Marine Pollution Bulletin 69:206–14. Day RH, Wehle DHS, Coleman FC. 1985. Ingestion of plastic pollutants by marine birds. In Proceedings of the Workshop on the Fate and Impact of Marine Debris, 27–29 November 1984, Honolulu, Hawaii, ed. RS Shomura, HO Yoshida, pp. 344–86. Tech. Memo. NOAA-TM-NMFS-SWFC-54. Washington, DC: Natl. Ocean. Atmos. Adm.
Browne MA, Niven SJ, Galloway TS, Rowland SJ, Thompson RC. 2013. Microplastic moves pollutants and additives to worms, reducing functions linked to health and biodiversity. Current Biology 23:2388–92. Galloway, T. S., Cole, M., & Lewis, C. (2017). Interactions of microplastic debris throughout the marine ecosystem. Nature Ecology & Evolution, 1(5), 0116. Available at: https://www.nature.com/articles/s41559-017-0116. Oliveira, M., Ribeiro, A., Hylland, K. & Guilhermino, L. Single and combined effects of microplastics and pyrene on juveniles (0+ group) of the common goby Pomatoschistus microps (Teleostei, Gobiidae) . Ecological Indicators, 34, 641–647 (2013). Available at: https://www.sciencedirect.com/science/article/pii/S1470160X13002501. Rist, S. E. et al. Suspended micro-sized PVC particles impair the performance and decrease survival in the Asian green mussel Perna viridis . Marine Pollution Bulletin 111, 213–220 (2016). Available at: https://www.sciencedirect.com/science/article/pii/S0025326X16305380. Ogonowski, M., Schür, C., Jarsén, Å. & Gorokhova, E. The effects of natural and anthropogenic microparticles on individual fitness in Daphnia magna. PLoS ONE 11, e0155063 (2016). Available at: http://journals.plos.org/plosone/article?id=10.1371/journal.pone.0155063. Cole, M., Lindeque, P., Fileman, E., Halsband, C. & Galloway, T. The impact of polystyrene microplastics on feeding, function and fecundity in the marine copepod Calanus helgolandicus. Environment, Science & Technology, 49, 1130–1137 (2015). Available at: https://www.ncbi.nlm.nih.gov/pubmed/25563688. Ogonowski, M., Schür, C., Jarsén, Å. & Gorokhova, E. The effects of natural and anthropogenic microparticles on individual fitness in Daphnia magna . PLoS ONE, 11, e0155063 (2016). Available at: http://journals.plos.org/plosone/article?id=10.1371/journal.pone.0155063. Welden, N. A. C. & Cowie, P. R. Environment and gut morphology influence microplastic retention in langoustine, Nephrops norvegicus. Environmental Pollution, 214, 859–865 (2016). Available at: http://oro.open.ac.uk/47539/. Watts, A. J. R., Urbina, M. A., Corr, S., Lewis, C. & Galloway, T. S. Ingestion of plastic microfibers by the crab Carcinus maenas and its effect on food consumption and energy balance. Environment, Science & Technology, 49, 14597–14604 (2015). Available at: https://pubs.acs.org/doi/10.1021/acs.est.5b04026. Wright, S., Rowe, D., Thompson, R. C. & Galloway, T. S. Microplastic ingestion decreases energy reserves in marine worms . Current Biology. 23, 1031–1033 (2013). Available at: https://core.ac.uk/download/pdf/43097705.pdf. Revel, M., Châtel, A., & Mouneyrac, C. (2018). Micro (nano) plastics: A threat to human health?. Current Opinion in Environmental Science & Health, 1, 17-23. Available at: https://www.sciencedirect.com/science/article/pii/S2468584417300235. Galloway T.S. (2015) Micro- and Nano-plastics and Human Health. In: Bergmann M., Gutow L., Klages M. (eds) Marine Anthropogenic Litter. Available at: https://link.springer.com/chapter/10.1007/978-3-319-16510-3_13. Güven, O., Gökdağ, K., Jovanović, B., & Kıdeyş, A. E. (2017). Microplastic litter composition of the Turkish territorial waters of the Mediterranean Sea, and its occurrence in the gastrointestinal tract of fish. Environmental Pollution, 223, 286-294. Available at: https://www.sciencedirect.com/science/article/pii/S0269749116323910. Jabeen, K., Su, L., Li, J., Yang, D., Tong, C., Mu, J., & Shi, H. (2017). Microplastics and mesoplastics in fish from coastal and fresh waters of China. Environmental Pollution, 221, 141-149. Available at: https://www.sciencedirect.com/science/article/pii/S0269749116311666. Bouwmeester, H., Hollman, P. C., & Peters, R. J. (2015). Potential health impact of environmentally released micro-and nanoplastics in the human food production chain: experiences from nanotoxicology. Environmental Science & Technology, 49(15), 8932-8947. Available at: https://pubs.acs.org/doi/abs/10.1021/acs.est.5b01090. Van Cauwenberghe, L., & Janssen, C. R. (2014). Microplastics in bivalves cultured for human consumption. Environmental Pollution, 193, 65-70. Available at: https://www.sciencedirect.com/science/article/pii/S0269749114002425. Liebezeit, G., & Liebezeit, E. (2013). Non-pollen particulates in honey and sugar. Food Additives & Contaminants: Part A, 30(12), 2136-2140. Available at: https://www.tandfonline.com/doi/abs/10.1080/19440049.2013.843025. Liebezeit, G., & Liebezeit, E. (2014). Synthetic particles as contaminants in German beers. Food Additives & Contaminants: Part A, 31(9), 1574-1578. Available at: https://www.tandfonline.com/doi/abs/10.1080/19440049.2014.945099. Yang, D., Shi, H., Li, L., Li, J., Jabeen, K., & Kolandhasamy, P. (2015). Microplastic pollution in table salts from China. Environmental Science & Technology, 49(22), 13622-13627. Available at: https://pubs.acs.org/doi/abs/10.1021/acs.est.5b03163. Wang, J., Tan, Z., Peng, J., Qiu, Q., & Li, M. (2016). The behaviors of microplastics in the marine environment. Marine Environmental Research, 113, 7-17. Available at: https://www.sciencedirect.com/science/article/pii/S0141113615300659. Foekema, E. M., De Gruijter, C., Mergia, M. T., van Franeker, J. A., Murk, A. J., & Koelmans, A. A. (2013). Plastic in north sea fish. Environmental Science & Technology, 47(15), 8818-8824. Available at: https://pubs.acs.org/doi/abs/10.1021/es400931b. Iñiguez, M. E., Conesa, J. A., & Fullana, A. (2017). Microplastics in Spanish Table Salt. Scientific Reports, 7 (1), 8620. Available at: https://www.nature.com/articles/s41598-017-09128-x. Biomagnification (sometimes termed 'bioamplification' or 'biological magnification'), is the increasing concentration of a substance in the tissues of organisms at successively higher levels in a food chain. This occurs as organisms at higher trophic levels eat significant masses of contaminated organisms at lower levels; with increased consumption, these concentrations can increase. Devriese, L. I., De Witte, B., Vethaak, A. D., Hostens, K., & Leslie, H. A. (2017). Bioaccumulation of PCBs from microplastics in Norway lobster (Nephrops norvegicus): An experimental study. Chemosphere, 186, 10-16. Available at: https://www.sciencedirect.com/science/article/pii/S0045653517311724. Avio, C. G., Gorbi, S., Milan, M., Benedetti, M., Fattorini, D., d'Errico, G., ... & Regoli, F. (2015). Pollutants bioavailability and toxicological risk from microplastics to marine mussels. Environmental Pollution, 198, 211-222. Available at: https://www.sciencedirect.com/science/article/pii/S0045653517311724. Brooks, A. L., Wang, S., & Jambeck, J. R. (2018). The Chinese import ban and its impact on global plastic waste trade. Science Advances, 4(6), eaat0131. Available at: http://advances.sciencemag.org/content/4/6/eaat0131. Chinese Ministry of Environmental Protection, “Announcement of releasing the Catalogues of Imported Wastes Management,” (Announcement no. 39, 2017).